Pick a style and stick to it. Look at multiple examples from the same time period and place as the finished piece that you are basing your work off of or what you are aiming for. Choose similar colors and use the same types of decorative elements. For more information, see my post of an art historical survey of illumination styles. Use historical or at least historically plausible colors. Avoid layering white over green, and spend enough time studying manuscripts and pigments that you have a sense of what colors were actually available. Scribes in specific time periods and places used distinct color palettes. Spend time looking at accurate facsimiles of medieval illuminations to determine what colors and combinations they found appealing. Go through the process of creating an illumination from start to finish, including planning and ruling out the page, at least once. 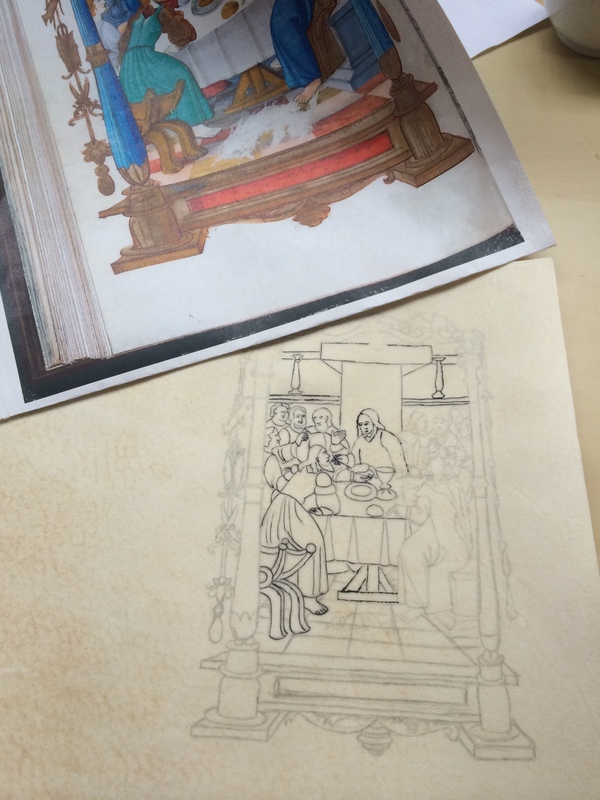 This will help you see how medieval artists conceptualized the page: manuscript art is unique in that it blends both textual and visual elements. Your painting on a charter needs to reflect the artistic style of the design and be somehow united with the text itself. Keep in mind the purpose of this art form. Illuminated manuscripts were used devotionally both within public spaces of worship and by private individuals. The aesthetic of illumination grew out of this context. Arguably, this is why manuscript illumination was more stylized than realistic. The artwork that we produce within the SCA is wholly secular; however, it does follow the same stylistic conventions. Additionally, the charters and scrolls we produce are intended to produce strong emotions in their viewers, and are physical relics that our Crowns and Coronets provide to those they value highly. SCA scribes surely take their work just as seriously as medieval scribes did! I’ve had a few opportunities to judge local arts and sciences competitions lately, as well as to be judged at our Kingdom arts and sciences championship, and it’s caused me to think a lot about how this process works. I find the experience of being judged to be incredibly valuable, and I think a lot of that has been I’ve had very good judges (especially recently! ); I spent some time thinking about what judges have done that has been useful to me and looked for ways to incorporate it into how I judge entries. I’ve previously (on my old blog) written about how to prepare to compete in the arts and sciences, now I’d like to share my thoughts on the other side of competition. First and foremost, be courteous. True courtesy and honor are the best parts of the Society — be a model of our shared virtues. Go in with the right mindset. See above! The thought that should be uppermost in your mind is that it is your job to promote the arts and sciences. How can you best do that in your role as judge? Give the entrant their due. Read their documentation (in advance if possible), listen to their whole presentation, and give them your full attention. I find it helps me to take notes during presentations. (I do the same thing when my students present in class.) I write down what I like, and what questions I have. This helps me give specific comments later. Ask good questions. Questioning is an incredibly important intellectual strategy that I think can be easily overlooked. The questions you ask should allow the entrant to demonstrate their knowledge (they should not be “gotcha!” questions), or help them consider aspects of their work more deeply. Some ideas to get you started: What was your main goal with this entry? What do you feel like was your biggest success? What was your most significant learning? What was one challenge that you faced and how did you overcome it? What do you have planned next? What will you do differently on your next project as a result of this one? BE. HONEST. Being courteous does not mean you are not allowed to point out areas for improvement — your comments must go beyond “great job” and a pat on the head. If it helps, think less about what they did wrong and more about what they could improve for next time, and use that to frame what you say. Normally, here is where this type of guide would tell you to try a “compliment sandwich,” but I happen to think that isn’t actually that helpful. Imagine this is the feedback you get from a judge: “I like the colors. Your embroidery needs a lot of work. Good job using wool thread instead of cotton.” The sandwich approach doesn’t actually soften the blow much, and these comments don’t help you get better.Here’s a hypothetical example of what I think is a better approach: let’s say I’m judging an entry of delicious and perfectly made suckets that use grapefruit peels. The maker consulted a few websites written by SCAdians, some of which included period recipes (although they didn’t use one specific recipe in their recreation), and they read The Medieval Kitchen and Early French Cookery for some general background information. Here is an example of the type of comments I’d be likely to give them: “These were really delicious, and making suckets is a hard skill to master, which makes it all the more impressive. I was also happy to see that you started with some period recipes, and the secondary sources you looked at are both ones that I trust. Have you tried other types of citrus peels? Grapefruits date to after the SCA’s time period — I can help you find resources on what kinds of peels would be more historical. Now that you’ve gotten good at the general process, your next step could be to research this more deeply, then pick one specific historical recipe to recreate, or a set of them (maybe from different time periods?) to compare, depending on what your overall goals are.” Yes, that’s long. Yes, the forms don’t give you a lot of room. But if I were a competitor, I’d find that so much more useful — the feedback is all specific and actionable, and I think that’s essential. Spread the wordfame of the competitors. Tell people about the cool projects you got to judge, and what you liked about them. Introduce competitors to other people who share their interests, and who can help them with research. Shine the spotlight on someone! This isn’t an exhaustive list by any means. Feel free to leave your own thoughts in the comments. If you found this list useful, please share the link. Also, if you are interested in publishing a version of this in a branch newsletter, use the contact form to get in touch with me and I’d be happy to send you a more usable version.